The Europe and Asia bureaus take a hit. 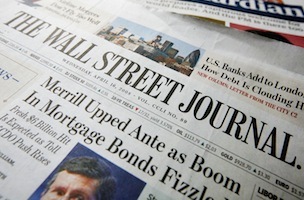 For the second time in three months, The Wall Street Journal is initiating a round of layoffs, this time targeting staff in its Asia and Europe bureaus. The cuts were first reported on in Politico. Details about the extent and nature of the cuts have not been disclosed. The WSJ 2020 program is a review of the newspaper announced by Dow Jones in October with the goal of identifying cost-cutting measures amidst an industrywide decline in print advertising revenues. Since the review has launched, those measures have included the downsizing of both ambition and staff for the Greater New York section, a round of buyouts that at least 48 employees participated in, and the merging of its Business & Tech and Money & Investing sections, all of which occurred in November.